Relationships between individuals underpin communities and societies. Marx's view of the ensemble as a 'collective individual' focuses on the notion that we are not isolated beings, but part of an interconnected network of people. This notion has become a prominent part of the mass consciousness in the form of social networking websites, which visualise relationships. We form relationships at physical locations, nodes of interaction, but these can then be abstracted to links in an intangible network. These nodes are multiple and dynamic - you might meet the same friends at entirely different locations each time, sometimes geographically similar, sometimes not. Interaction can also take place virtually - by mail, telephones, internet communication, etc. but physical interaction strengthens relations. These nodes can be anything which facilitates people interacting - a bench, a sports field, a swing. The home is a powerful node of interaction - you invite close relations into your home to interact; successful mass housing can encourage interaction, and the formation of communities. The phrase 'ensemble of social relations' was used by Marx to describe and define the 'human essence' - that the human essence is "not an abstraction inherent to the single individuals; it is the ensemble of the social relations. "1 That the individual is not an isolated being but should be conceived as a social multiplicity, not one, but one as part of a whole, and it is necessary to consider the individual given their social relations - i.e. they should be conceived socially. Social relations form at physical points, but as these points are not static, mapping the interactions between individuals becomes problematic. A limited method is to locate members of a community by where they live, but this only indicates their geographic location whilst at home. Considering networks as geographically located nodes of interaction would reveal multiple common nodes which are used by multiple members of a network - place of work, gym, creche, shop, park, etc. 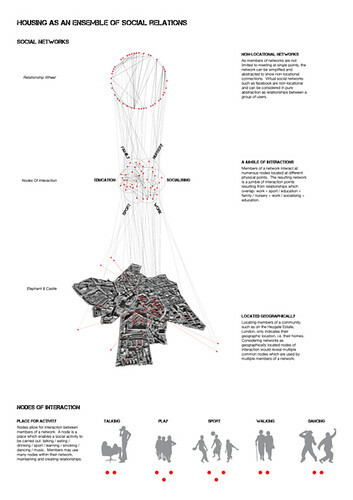 By mapping points of interaction we can see common places at which members of a social network congregate. Mapping interaction between members of a network results in a jumble of points resulting from relationships which overlap: work + sport / education + family / nursery + work / socialising + education. Whilst this appears indecipherable it can highlight common areas which are used for or can encourage social interaction. As members of networks are not limited to meeting at single points, the network can be simplified and abstracted to show non-locational connections. Virtual social networks such as facebook are non-locational and can be considered in pure abstraction as relationships between a group of users. This abstract representation removes the geographic location points which ground social relations, distancing networks from the architecture of interaction.